The HDMI-EXT-1101C HDMI Extender over Single Cat.X with Direct Plug-in Receiver boosts up your video/audio transmission distance up to 25m (80ft) in HDTV 1080i format. With only one cost effective LAN cable, users can directly plug the receiver in to HDTV sources from DVD players, Blu-ray Disc player, PS3, PC, and any other kinds of sources compliant with TMDS to distant display monitors including HDMI/DVI enabled TV sets or LCD PC monitors. This cost effective flexibility makes HDCP compliant DVD players or PS3 transmit high quality video and audio with a greater distance at the minimal cost, when integrating several components apart. The HDMI-EXT-1101C includes two units: transmitting (HDMI-EXT-1101C -TX) and receiving (HDMI-EXT-1101C -RX) units. 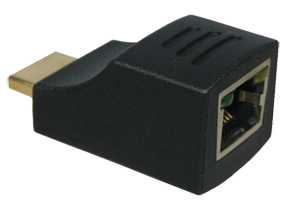 The transmitting unit is used to capture the input HDMI/DVI signals and carry the signals through one RJ45 connector into one cost effective Cat-5/5e/6 cable. The transmission distance between the sending and receiving units can be up to 25m (80ft) under HD (720p/1080i) or 15m (50ft) under Full HD (1080p). With direct plug-in to the HDTV, users do not need to have to find a power outlet for the traditional HDMI over CAT5 receiver and can save an HDMI cable with ease of use.